I want this to be a forum for honest discussion, and welcome all comments to that end. Please respect basic norms of civility and respect. Disagreement is welcome, but I will delete comments that I deem malicious or slanderous. Please feel free to provide links to relevant articles and sites if they relate to the discussion, but avoid just a bunch of links. WordPress’s spam settings are not always 100% reliable—if your comment does not appear, drop me an email and I’ll try to fix the problem. On a technical level, it’s most helpful if you reply directly to the specific comment that you are addressing (comments can be nested up to three deep). Just click on “Reply” at the bottom of the comment you are responding to and it will show up as a response to that specific comment. On long comment threads, this makes it easier to track the conversation than if each new comment just appears at the bottom of the thread. To sum up: follow the golden rule and I will try to do the same. Sometimes it can be easy to forget that there are real human beings behind words on a screen—especially if we find those words threatening or they make us angry. Blog commenting can quite easily degenerate into hurling insults at one other in an accountability-free vacuum. No problem at all, Paula. The picture doesn’t actually belong to me – it’s public domain (I found it on a google search). Must be an interesting research project! Bravo. Well, said. I might quote you in my own comment/etiquette section. I was just cleaning out a magazine stand, and read your article in the MB Herald “Hockey Dad”. I have to say, your words were so inspiring. I am a “Hockey Mom”, who was born and raised in Arizona – married my best friend from Saskatchewan and voila – hockey mom of 3. I actually started skating/playing a couple of years ago due to my love of the game. It is so easy to love this game, but we have struggled with where the committment it takes fits in with our committment to our church and other areas. I have searched for the ways I can reflect Christ to my hockey families and have shared my testimony with a few – but your article has given me a new desire to make my all-time coach, Chirst, proud of my effort. Those are words an athlete can understand. Thank you so much, and keep your head at playoffs. Thank you very much for the kind words, Julie. Like you, I find the commitment required to be a challenge—especially when Sunday mornings don’t work very well for me (at least not after 8:30 am!). It takes quite a balancing act some days, and we’re only at the beginning of the journey! I imagine it will get even trickier as my son gets older. We’ve just signed him up for “spring hockey” so the march goes on :). I like the spirit of your “rules” for commenting. Really, that is the only way to go! Thank you for that. I just — over the last 6 weeks or so — got a blog up and running and would like the exchange to be the same (only have a few comments so far). If you’re being told what you should do, or what you must do, or a group or individual claims to stand for freedom, but prohibits or inhibits you from thinking for yourself: That’s not compatible with freedom … That’s a disconnect between what they say and what they do. If individuals, teachers or coaches encourage and help you to discover your own best options, to find your own truth … they know there are many doorways to healing and joy, and are truly interested in your growth and happiness … They’re delighted when you discover the clarity of your own guidance … and they are respecting your innate curiosity … individuality … independence. Thank you for the kind words, Al. Pastor Ryan….Thank you Sir for your blog. Denise has told me about it, but it took me far too long to thank you for the work you do. At some point, I would like to invite you to lunch, or chores, or whatever, to talk. That would be fantastic, Rob—I look forward to it. And thank you for the kind words. 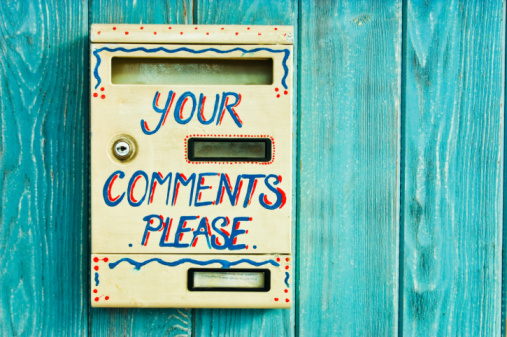 I really like the ‘your comments please’ image. Would you object if I could use this for an image montage I am putting together? No problem at all, Mike, although the image is public domain… I don’t even remember where I found it, truth be told. I like your title and the way you get to little hope(s). Thanks for the blog Ryan! Sorry. Not at all. I just really liked what you said about hope and to me at least you ended up saying that our hopes are often just little. Very sorry if i offended. You are a tabulous writer, Ryan. I enjoy all your posts. You write w a lot if energy and vigor. Again, thank you for your very kind words. I do appreciate them. No problem at all, Abe. Sorry for unnecessarily confusing things. I have just discovered your blog, and so enjoy your insights and honesty and you have a wonderful writing style. I was particularly touched by your most recent blog about the TRC, as you shared Ronnie’s story from the Sault. I am the minister at Central United in the Sault, and I have been considering including more aboriginal references in our services, and ways to connect with our First Nations community. You have given me food for thought. At the core, is story-telling- so fundamental both to Christians and First Nation cultures. Thank you for passing on Ron’s story- it will stay with me today. Thank you so much, Laurie. I appreciate your taking the time to write. Yes, it is as you say, stories are so fundamental to how we understand who we are, where we belong, where we’re going. We are storied creatures. It is a Christian duty to be responsible to the blessings given being they are tangible or intangible. The blessing of freedom is not given without purpose. And as Christians…we are called to be harmless as doves and wise as serpents. Meaning…we need to ask for discernment. As to that purpose, I am almost certain that at the microcosm the author locks his doors at night. Asked why…for the safety of his family. That is the microcosm of the macrocosm of the collective security we must have for the nation. We are duty bound by Christian responsibility to protect our families, our community, our nation. Equally…we are called to go and preach the word. Receiving or not receiving the refugees isn’t a reflection on our Christian character. There is more to be considered and casting it as one or the other is wrong. ISIS is honest in their design and statements. They forecasted the immigration/refugee crisis to deliver their army to our shores and they have infiltrated the refugee migration. The first responsibility of government is to secure/protect its people. Not fulfill our Christian duties for us. If anyone reading this thinks that the government is to be the proxy of our Christian effort they are wrong. The law of government is written in its enumerated powers per the Constitution. Expecting the government to act outside of it because we want someone one on our shores especially given the current crisis is a vacating of the rule of law. That is not a Christian standard. By the author’s standard…we should have no borders…Christians should not hire police to keep bad people away or arrest them. We shouldn’t lock our doors. We must be discerning to the darkness of men…not just to light in which we walk. As Nehemiah rebuilt the wall of Jerusalem he established protocols for defense. If the Old Testament was written as an example for us, should we not give pause to consider this. ISIS is interested in tearing down our walls…as Christians we need to be thinking about how we can retain our freedom, defend our nation…all while delivering the Gospel. If we think that we can capitulate to government being the proxy of the our Great Commission, then persecution by enemy in the gates may come upon us and send us abroad to rectify our understanding of scripture and admonish us to Christian responsibility to all the blessings we’ve received. Right -On! Very well stated Anthony. This country still provides aid to refugees and so do Christian Ministries/Organizations. Mr. Ryan and folks like him slide under the Christian banner and attempt to accuse the brethren of being unloving by substituting our nay to refugee immigration as to be indifference. The naive are once again, brain soiled by religio-political rhetoric. Christ does not accuse Himself. Beware of wolves. Saw the CNN article just now on what you and your community are doing to help the Syrian refugees. Your outreach to them is truly heartwarming. Thank God for people like you. We are all citizens of the earth and should help those who need it. Your community’s compassion helps me keep my faith in humanity. Thank you from the bottom of my heart. Thank you, Kathy, for this kind affirmation.